Classic white air return grilles which are circular can be hard to find. 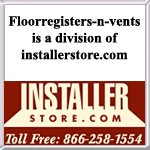 Our 6” round air vent is now available for home renovations and for replacing old vents. This air return grille will cover a hole opening which measures 6” in diameter. Most round air vents can be found on the ceiling and can be hard to install. This air return grille is simply screw mounted over the opening with the screws which are provided. Once done, the round air vent will allow air to flow through the room with it’s continuously open fins. The air return grilles are finished in a powder coating and painted white for a traditional and subtle look. Durable and stylish, the round air vent is made out of all steel and can be used in both residential and commercial applications. Tip: When ordering the round air vent cover, do not measure your existing ceiling grille manufacturers do not have a standard faceplate size. The 6" air return grille will fit over a hole which measures 6" in diameter. 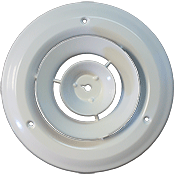 Our round air vent is also available with a damper which can then close off the airflow in your bathroom or bedroom. This air return grille can be bought for one low cost and shipped straight to your home so order now.